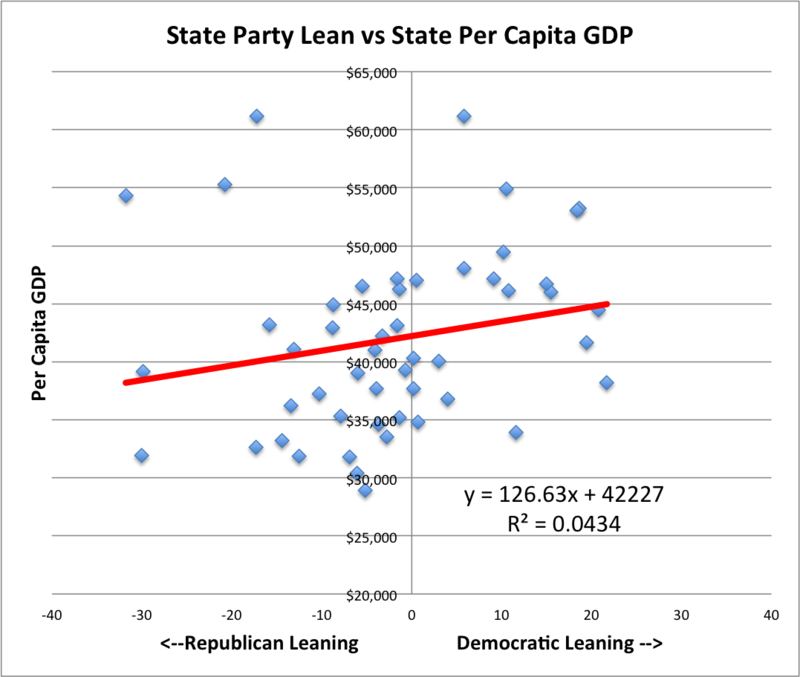 For this study we compared data from a recent Gallup poll concerning how each state “leans” with regard to party identification and per capita GDP. The Gallup poll was gathered in 2015. The GDP data was collected in 2012. Gallup compared Democrat versus Republican leaning by subtracting the percentage of people who identified as Republican from the percentage who identified as Democrat. Data values range from about -30.0 meaning 30% more residents identify as Republican than Democrat, to +30.0 meaning 30% more identify as Democratic. The top 10 Democratic leaning states are, in order: VT, HI, RI, MA, NY, CA, MD, NM, IL, CT. The top 10 Republican leaning states are, in order: WY, ID, UT, ND, AL, AK, SD, MT, OK, KS. Our source for GDP data is wikipedia, who in turn got their data from the Bureau of Economic Analysis. Per capita GDP ranges from $29,000 (MS) to $61,000 (DE and AK). The top 10 states by per capita GDP (largest first) are: DE, AK, ND, CT, WY, MA, NY, NJ, OR, WA. The bottom 10 states by per capita GDP (smallest first) are: MS, WV, AR, SC, ID, AL, MT, KY, NM, ME. We can compare the relationship between these two factors using a scatter plot. In this plot each dot represents one state. The horizontal (X) location of each dot represents the states Republican or Democratic leaning (more Republican is to the left, more Democratic is to the right). The vertical (Y) location indicates per capita GDP. A scatterplot indicating the relationship between Democratic vs Republican leaning and per capita GDP by state. As you can see there is a weak relationship between between the two factors: More Democratic leaning states have, on average, a slightly higher per capita GDP. We can assess the strength of this relationship quantitatively: The correlation between the two factors is 0.21. R-squared is 0.04. These measures indicate a weak but positive relationship between the factors. ← How do stop-loss orders affect trading strategy performance?